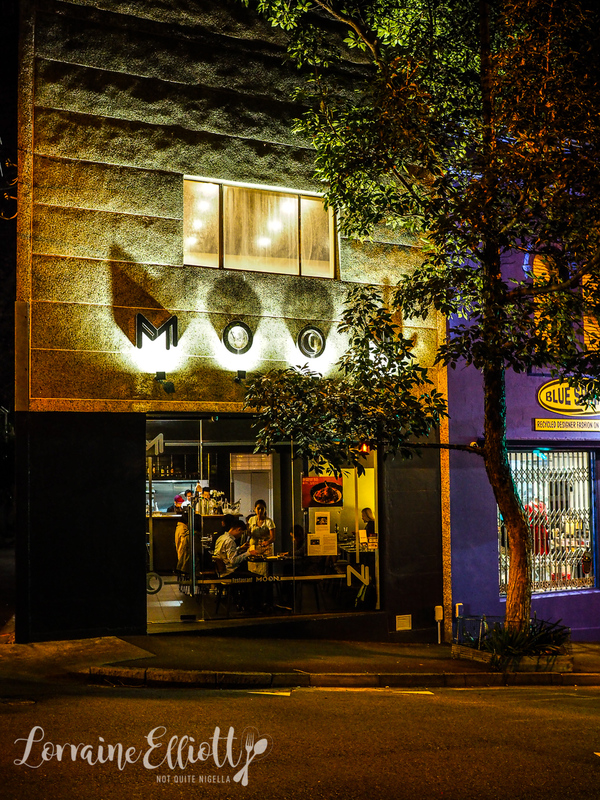 Moon Thai is a new upmarket Thai restaurant that sits on Victoria Rd where Onde used to be for 21 years. It's a perfectly framed spot for this evening's glowing moon, the dark of the wintry night the ideal clouded backdrop. 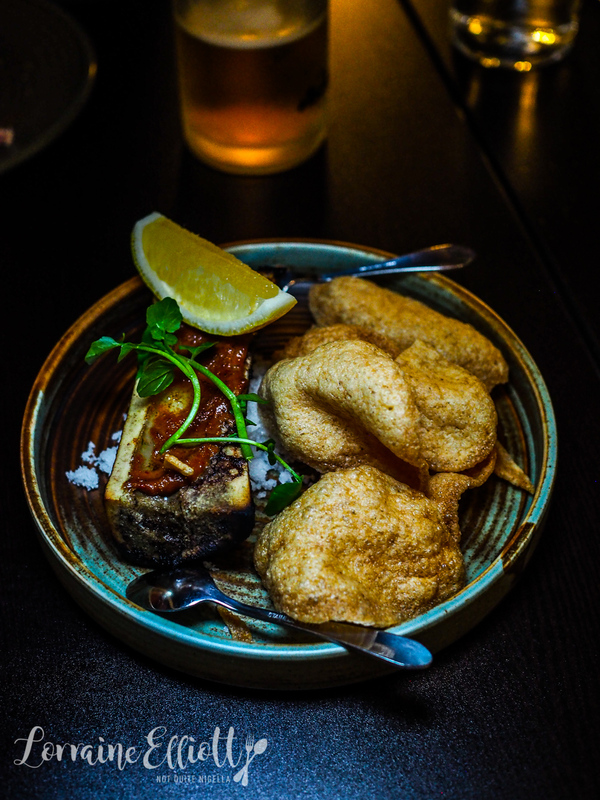 The menu features Thai flavours combined with some light European or Modern Australian elements. I'm early, about 15 minutes early, the 15 minutes I put aside to find a park unnecessary because I find a spot right around the corner. "How do you always find parks like this?" asks Ivy. "I have lucky feathers in my car," I respond causing Ryan to roll his eyes (hey you do what you need to to find a park in Sydney). I've left Mr NQN at home as he is sick but we have Ivy, Ryan, Louise and Viggo present. For a place that has only been open a few weeks Moon Thai is fairly busy. The head chef formerly of Longrain Aum Touchpong Chancaw called the restaurant Moon Thai because as he explains, "As a kid, I wanted to be an astronaut. I wanted a feeling of excitement in my normal life. Bangkok nothing really exciting ever happened in my home town and the food was good but never WOW. 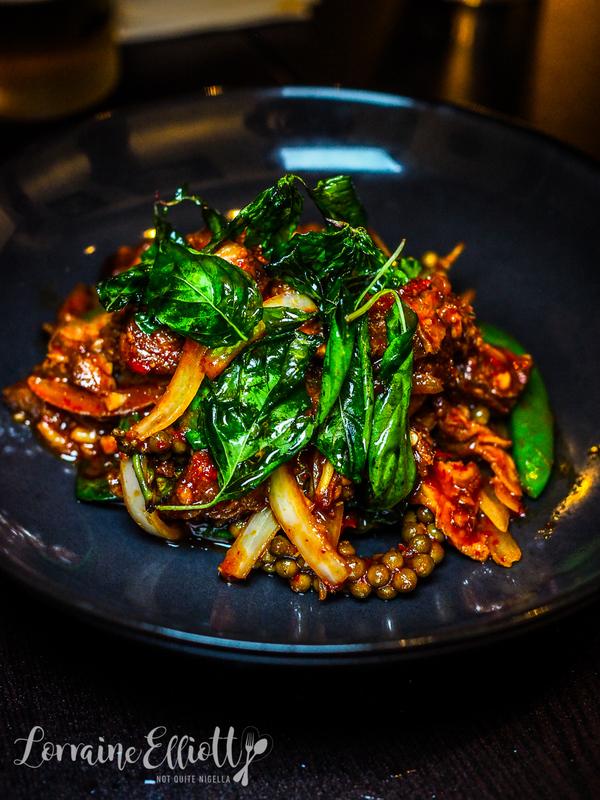 After leaving Thailand, having worked in Europe and seeing what Europe was doing with their cuisine, I wanted to make Thai food WOW by adding European ingredients and technique to my Thai cooking." The menu is broken up into crescent, half and full moon sections, depending on size and I've already stalked it online so everyone just leaves me to order. I start with a coconut smoothie, perfectly sweet and creamy with lots of coconut milk. The smells coming out of the kitchen are driving us slightly wild as we are so hungry and it takes a small while for the first few bites to come out but once they start everything comes. 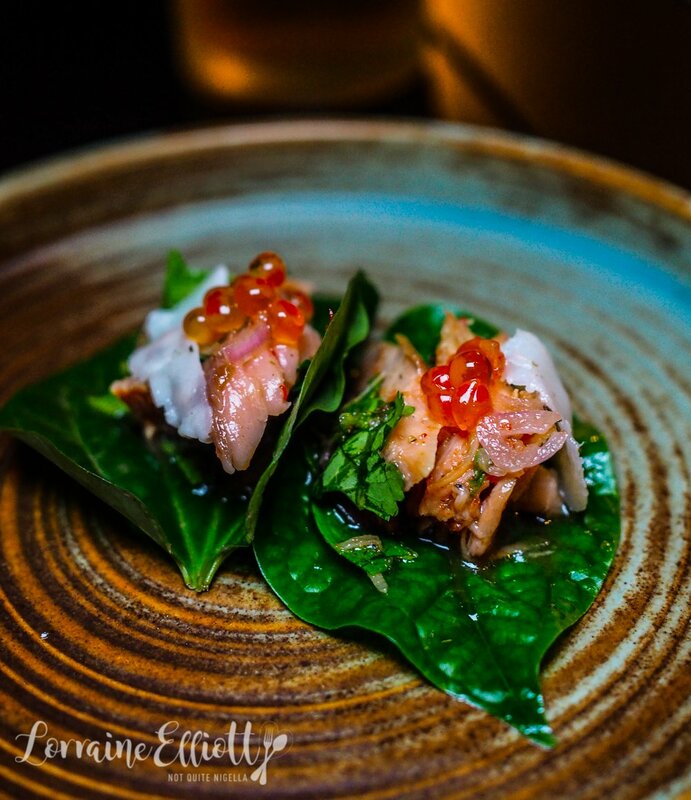 The betel leaves are topped with Tasmanian cold smoked salmon, caramelised coconut, chilli and lardo. There's quite a bit of sauce that comes out of these but the mouthful is tasty. 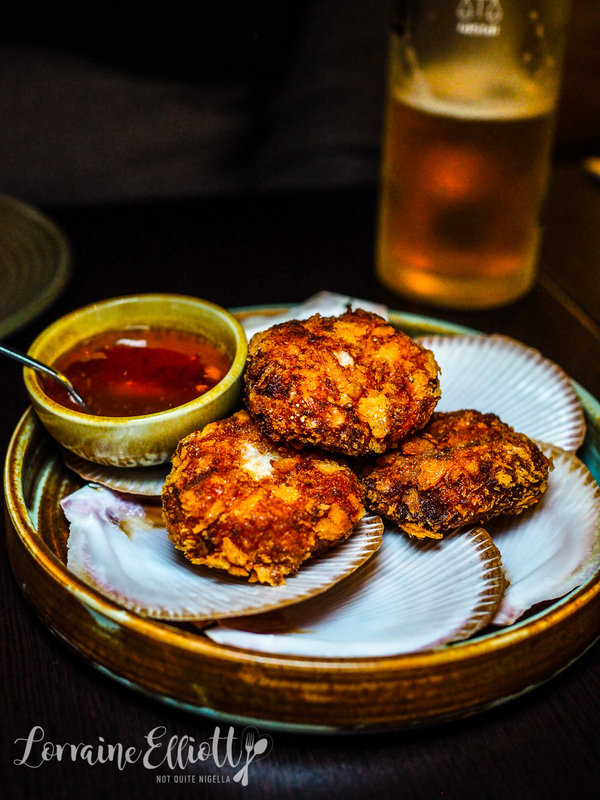 I enjoyed the crunchy deep fried scallop dumplings with chunks of Hokkaido scallops paired with a viscous but deliciously tangy but sweet umeboshi plum jam. I usually love bone marrow. This is good but it needs a bit more than lemon to lift the unctuous, jellied filling. The fermented pepper relish does a bit in aid of this and the spicy crackers give it a nice crunch but I think one would need to share this serve as it is very rich. I love chicken ribs and these are coated in ground rice which gives it a crunchy, cornmealy texture and a heavenly mix of spices. "Holy s&^^!" exclaims Ryan as he takes a bite of this. It really is a thousand flavours in one and they tell us that one table of three men ordered a serve, then ordered separate serves as well as a serve to take away. I totally get that. Chef Aum explains, "I want there to be a balance between sweet, sour, salty and a bit of bitterness. It gives any protein I work with dimensions. 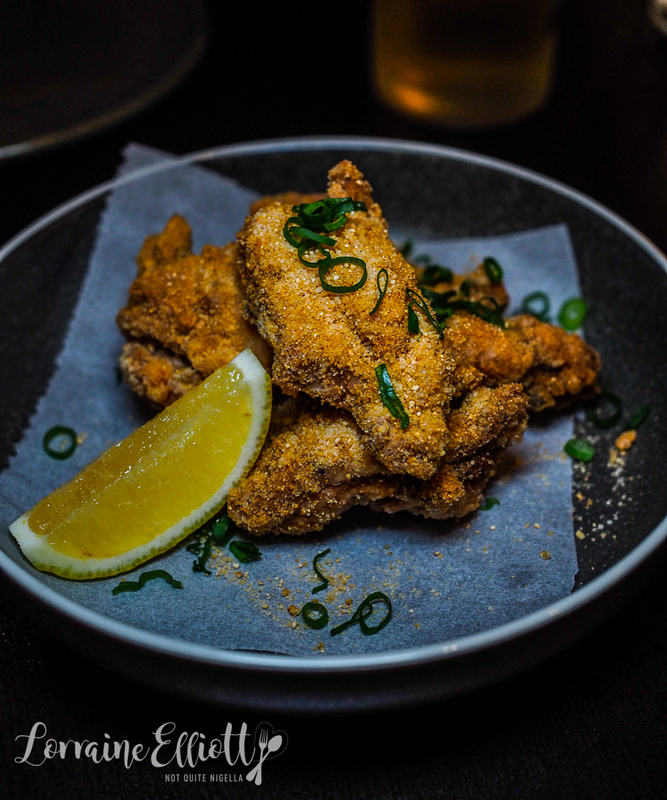 For our chicken ribs, I’ve created a secret spice mix blending together garlic powder, sea salt, paprika and citric acid." Then comes my other favourite dish of the night. It's also their signature dish and it is 72 hour braised beef ribs with the meat taken off the bone and sliced to show that it is still pink in the centre. 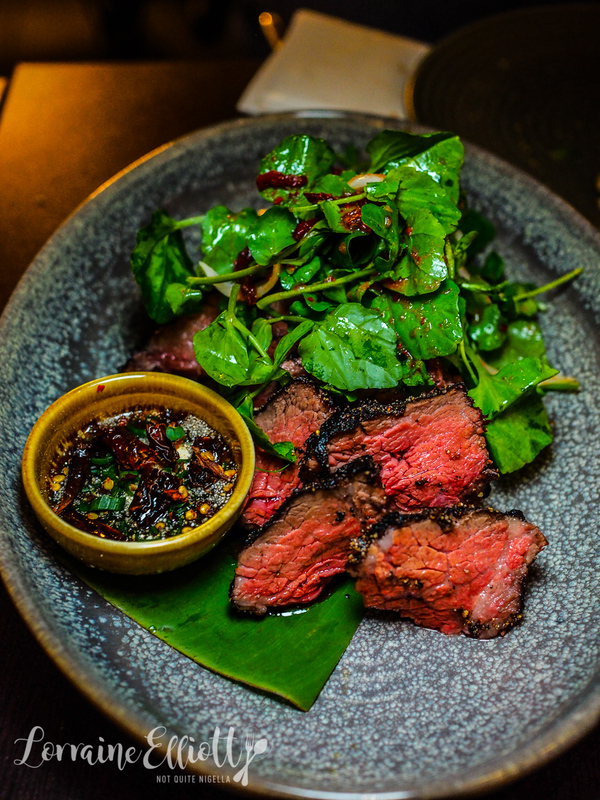 The tamarind glazed beef outside is crispy but each piece simply melts in the mouth. It comes with watercress as well as a semi dried tomato and dried chilli sauce that packs a nice hit of heat. All I want to do is order another plate of this to take home along with the ribs. "For our beef ribs, I start by locking in the juices and natural flavours. So I begin with searing the beef rib. I then season the beef rib and vacuum seal it; to be sous vide at 55 degrees for 72 hours. 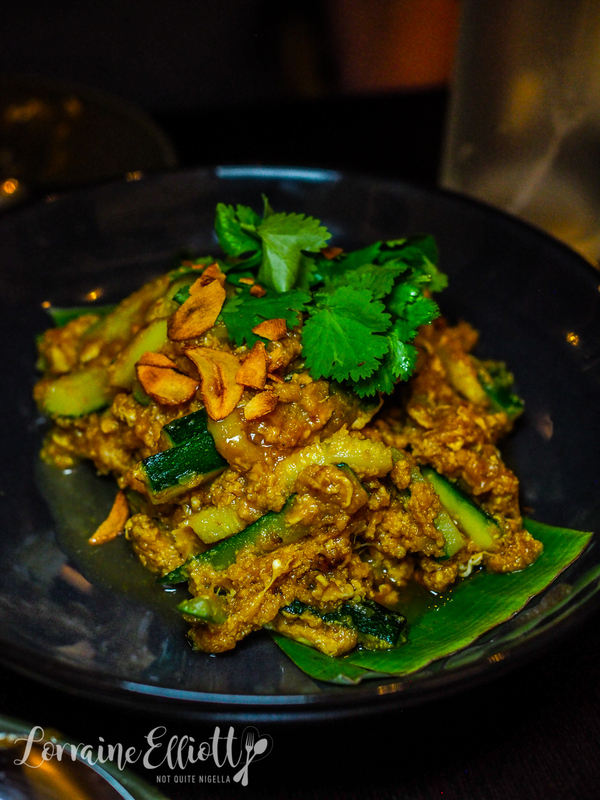 During service, once ordered I coat in a roasted rice powder and grill it," says Chef Aum. 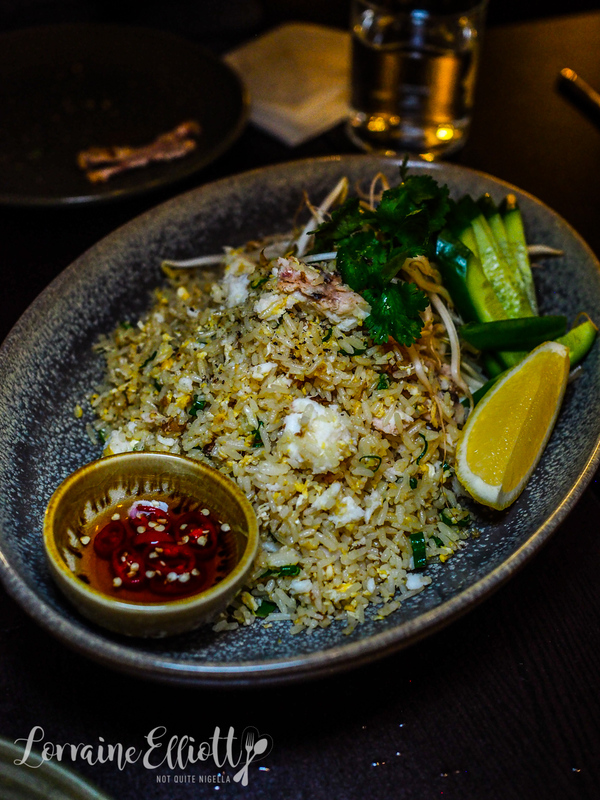 The crab fried rice is a very generously sized portion with plenty of large chunks of crab meat so you really get the flavour of crab throughout each mouthful. It comes with a pickled smoked chilli sauce and bean sprouts and cucumber on the side. It's a good accompaniment to the beef short rib. The mains are sizeable and really ideal for sharing between 3 or 4 people. We were tossing up between this duck confit and the aged duck which Louise wanted but they were out of the aged duck so we ordered this. 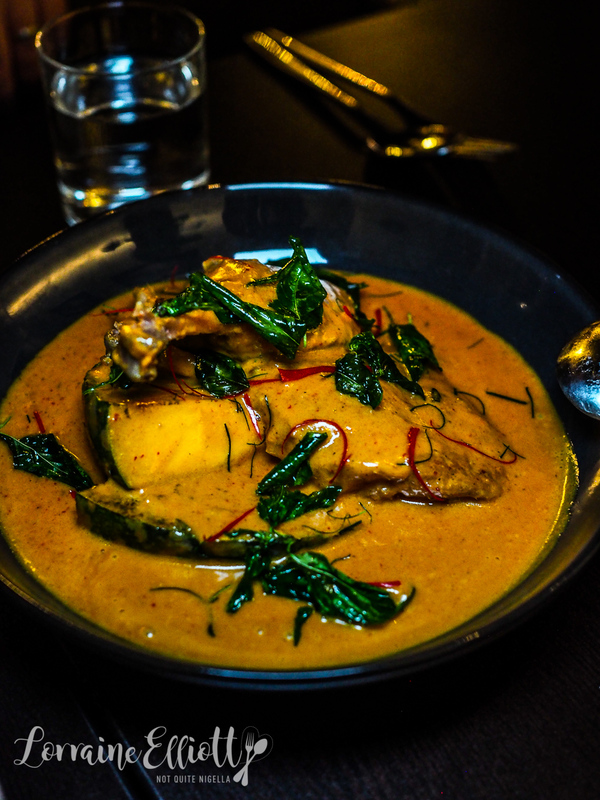 The Panang curry sauce is sweet, spicy and creamy and the meat on the two duck marylands comes off the bone easily. It's so good I go back for thirds and before I know it I've eaten so much that I'm hurting a bit. Yes I'm that person. I have to admit I rarely order crispy pork belly at Thai restaurants because I find it dry. The rest of the group like this though and although my piece is dry they have more luck. It's coated in a spicy paste and served with sugar snap peas, galangal, basil and plenty of strands of green peppercorns. I think we all expected the vegetables to come out differently. There's a light egg mousse on top of the zucchini and pumpkin. There are large slices of fried garlic on top that add a surprise pungency and the whole dish is full of flavour. There are three desserts on the menu and they come out one at a time. The first isn't bad, it's like a coconut Thai panna cotta with rubies or a version of Tub Tim Grob. 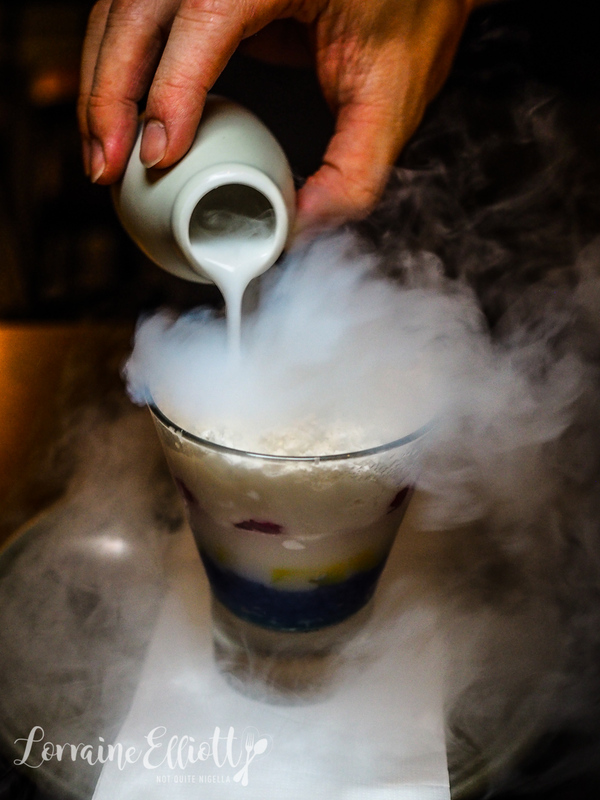 While there are theatrics with dry ice smoke at the table, it's made of coconut panna cotta water, water chestnut rubies that are coated in coloured tapioca flour, coconut nitro and coconut milk. The second dessert is a beauty and lovely in its simple refreshingness. It's the desert you order after a big meal just for a spoonful of something light, tart and refreshing. 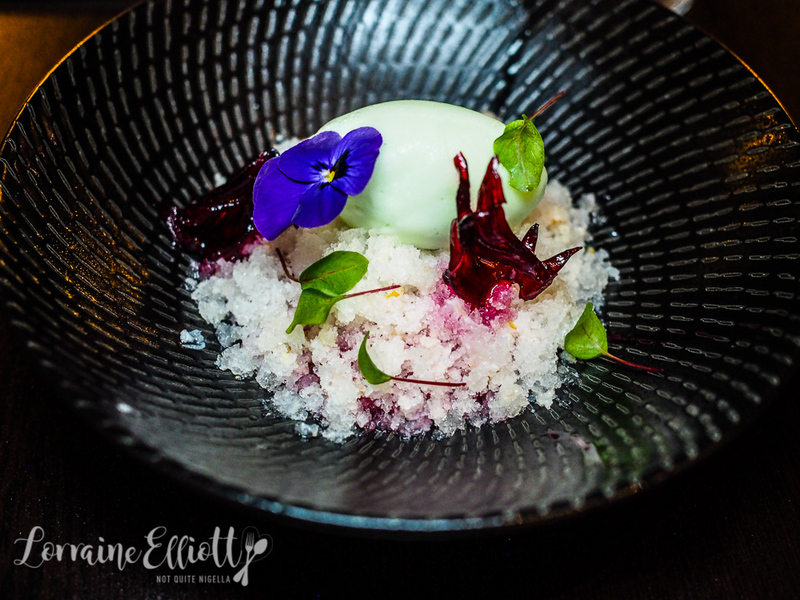 There's green apple sorbet, lychee granita, rhubarb compote and sweet rosella flowers. The third dessert is my favourite. It's a dulce de leche tart with a beautifully short crust to it that begs multiple attempts at sampling. 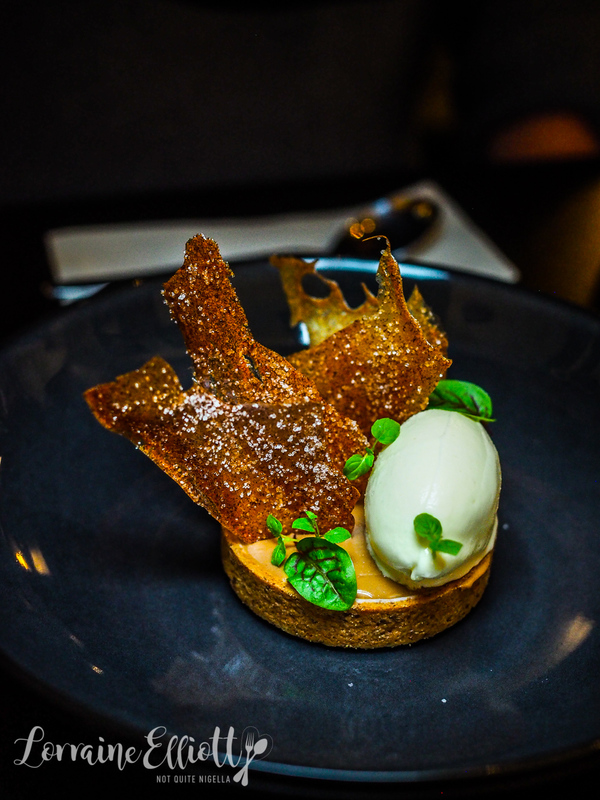 It's topped with paper thin shards of banana tuile and to the side is a quennelle of passionfruit sorbet. This sorbet is mild, almost like passionfruit mixed with another fruit as passionfruit is usually so distinct and tart. I keep going back and back for more of this although my stomach is telling me to be more restrained. So tell me Dear Reader, do you carry any lucky tokens to aid in life? Have you ever sworn when you've liked a food so much? And do you carry on eating after you feel full? 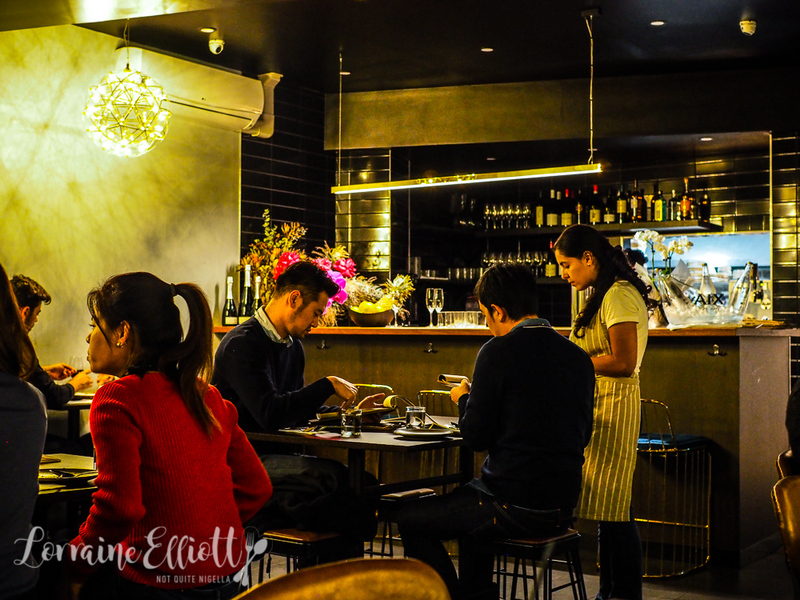 featureArun Thai, Potts Point & Win 1 of 4 Copies of Kham's Sai Mae Nam! feature Arun Thai, Potts Point & Win 1 of 4 Copies of Kham's Sai Mae Nam!